Newton Aycliffe drew 2-2 away to Bishop Auckland in the FA Vase after extra time, and will replay the tie on Tuesday night (September 4). The Bishops bossed the first half. Fryatt went on a good run for Bishops early on but put his shot high and wide. Keeper James Winter (pictured above) then made a good save low down from Johnson. On the half hour Hoganson hit a good shot for Bishops which hit the bar. Aycliffe had a better spell as the half progressed. Stuart Thompson beat several Bishops players during a mazy run, but hit his shot straight at Bishops keeper Liversedge. Then Connor Dunlavey got a shot away, but it was deflected, allowing Liversedge to save. Early in the second half, Dunlavey was put through but hit his shot just past the far post. Patton was the main danger for Bishops and he had two good chances, hitting one straight at Winter and one high and wide. Ryder then also had two good chances as Bishops got on top. Aycliffe cleared a shot off the line on 64 minutes. A minute later the pressure told when Winter had to come well out of goal to help his defence, but could only clear to Patton who put it in the net from distance. Ian Ward came on as substitute for Aycliffe and equalised with his first touch. Liversedge could only punch a cross straight to Ward, who lobbed it over two defenders into the net. Bishops were back in front four minutes later when Patton hit an unstoppable shot past Winter. 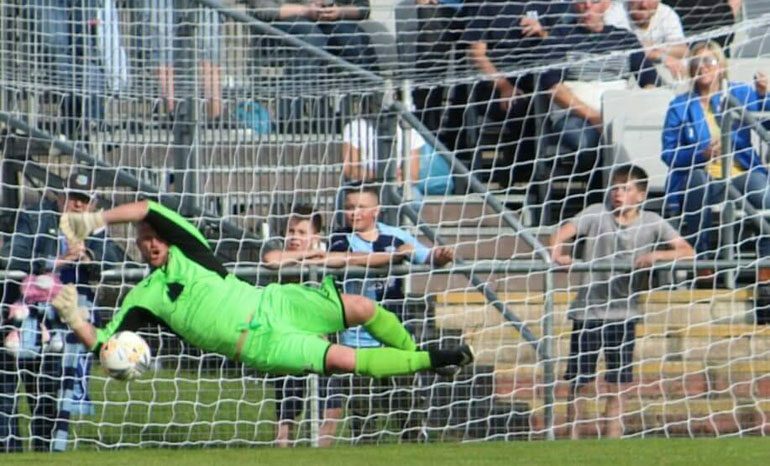 Bishops went for another goal, and Aycliffe man-of-the match Winter made two great saves. Aycliffe equalised in the fifth minute of injury-time. Winter went up for a corner; the ball came out to him, and he beat his man and crossed the ball. Bishops didn’t clear it, and it fell to Daniel Kent who smashed it into the back of the net. Following the replay, Aycliffe’s next game is against West Auckland at home in the league on Saturday (September 8).